About 2,376 stranded tourists, including several foreign nationals, have been evacuated from Neil and Havelock Islands by Indian security forces and the Union Territory administration, on 10 December. An official of the UT disaster department said a fleet of seven ships and six helicopters evacuated all tourists, from the two islands. He added that the Navy, Coast Guard, Air Force and Union Territory administration in a joint evacuation drive have brought back all stranded tourists to Port Blair from Havelock and Neil islands of the Andaman and Nicobar. Twelve foreigners - including two Germans, four Spanish and one Israeli national - were among the tourists stranded due to cyclonic weather since 5 December. Lt Governor of the Islands Jagdish Mukhi said there was no untoward incident and no loss of life or property due to weather conditions. Earlier, evacuations began with five naval ships, two coast guard ships and three Indian Air Force choppers kicking into action. The evacuations happened two days after the administration of Andaman and Nicobar sought the Indian Navy's help. Ships of the Andaman Nicobar Administration and Helicopter of the UT also participated in the evacuation drive. 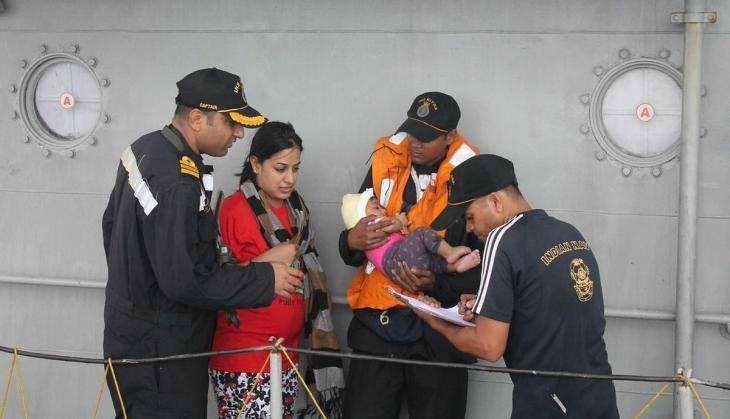 Four Indian Navy ships -- INS Bitra, Bangaram, Kumbhir and LCU 38 -- were deployed to undertake the evacuation of the stranded tourists. The evacuation operations started after weather conditions improved later into Friday evening. Heavy rains developing into a flood-like situation, had led to more than a thousand people being stranded for over three days on the islands with no mobile or internet connectivity. Havelock Island is the largest chain of Islands and is a famous tourist destination, and is located 40 km from the capital Port Blair.